Odette, Clarice, and Barbara Jean have been friends since they were young, their favorite meeting spot is their table at Earl’s All-You-Can-Eat Diner. Labeled “The Supremes” by the folks of the town, the trio have grown up with the wise advice of Big Earl, who presides over the All-You-Can-Eat with wisdom, humor, and good food. The story begins with the death of Big Earl. His death sets the Supremes on a course to reflect on their 40 year friendship, and to reflect on the choices they’ve made in their lives. Odette, the fearless one, has to face something fearful. Clarice must make peace with her marriage and her husband’s wandering ways. But it is Barbara Jean who must face the greatest challenge of all….she has to set right a wrong, track down a lost love, and find a way to ease the desperate grief she still carries over the death of her son. This story unfolds gently, giving us glimpses of the past and of the present as the heart of each of the Supremes is revealed. We meet the members of the Plainsview, Indiana community, and come to love them as the Supremes do. It is a story filled with warmth, friendship, humor, ghosts, tragedy, and hope. How the author is able to so capture the hearts and souls of the three central characters–who are aging, black women–is astonishing. This is a wonderful tale. 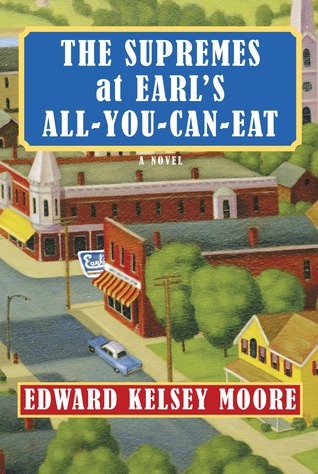 Edward Kelsey Moore was born in Indiana, and received a Bachelor of Music degree from Indiana University. While he now lives in Chicago, his novel is filled with the essence of a small Indiana town. His website says he is working on his second book, and I am already looking forward to it.